Heavenly blog! : No. 1688: I have not said anything about the narrator Jan Aage Torp than what the Apostle Paul said that he was surrendered in Satan's hands and he is now the root of Torp's life after the Bible's teaching! No. 1688: I have not said anything about the narrator Jan Aage Torp than what the Apostle Paul said that he was surrendered in Satan's hands and he is now the root of Torp's life after the Bible's teaching! No. 1688:I have not said anything about the narrator Jan Aage Torp than what the Apostle Paul said that he was surrendered in Satan's hands and he is now the root of Torp's life after the Bible's teaching! 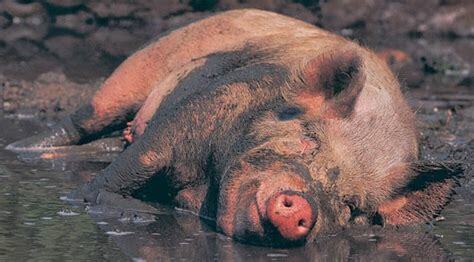 Picture of a pig who walks in the mud. Thus says the Scriptures Torp and all others who are reprisaled as believers are. First, they were cleansed in the blood of Jesus, so they return to Satan's way and will with their lives. Scripture clearly teaches that after a divorce for a believer they shall either live alone or resign. I think it's regrettable that Jan-Aage Torp does not end up being a pastor. The reason is not just the story that his son appears in today's issue of the A magazine. My reasoning is more comprehensive. Here are some words.Jan-Aage Torp is a pastor. Also the term apostle is used for his ministry. Nevertheless, it is natural to emphasize what Paul asks as a supervisor's requirement. Here are some important verses from 1 Timothy 3.2-7: "Therefore, an overseer must be impeccable, one woman's man, precious, sincere, worthy, hospitable, capable of teaching others, not drinking, not violent, but mild, not fights or cashmere. He must manage his house well and have obedient children with all honesty. But whoever does not know how to govern his own house, how can he care for the church of God? He must not be converted, lest he be inflated and fall under the devil's judgment. He must also have good testimony from those outside, so that he will not be mocked and caught in the snare of the devil. "These words present great ideals. First of all, let me say that I (of course) does not believe that a Christian leader should be perfect. We are all sinners. Fortunately, the Bible says that God can also use weak and wrong people. At the same time, I think the words of Paul represent a scale of relevance and importance. We have no right to cancel the meaning of these words because no one is flawless. A Christian leader relies on trust. Therefore, there must be a connection between life and learning. When it comes to Jan-Aage Torp, I think that he himself has weakened his trust in a fundamental way, especially in recent years. I think it's uncomfortable to claim. But I actually think it's even more difficult to be completely silent - for his conduct he has discredited the entire Christian church in Norway. The last example relates to the story the son is now telling. It's simply shaking, even though I take into account that the media do not give a completely balanced representation, even though Torp has had the opportunity to respond. Many Christian leaders have experienced that their children have gone away from faith. Some would think that it in itself disqualifies a pastor. I do not think so. Also, pastor children must have the opportunity to choose their own faith. But the story of Anders Torp is very special, also because the son today has broken all contact with his father. It goes without saying that trust in Torp. Even more serious, since Torp today admits that the theology he made sure his son was met was unhealthy. To some extent, it is good that Torp takes self-criticism. The problem is just that there are limits to how many times a person can greatly upset their mistakes - and still keep trust. Torp prophesied bloodbath during the Olympics in Athens, something he later regretted. In today's articles, he regrets both contact with the Danish "Father's House" and "Spirit-Driveners" from Zambia. That's why there is reason to ask if Torp has shown sufficient spiritual discretion. I do not think so. In addition, I think of much of the substance found on the website of Oslo Church, and the blog of Jan-Aage Torp shows that Torp still markets an extraordinary charismatic approach. It is very problematic. Lastly, Jan-Aage Torp is married again. This is a difficult point to comment - as regards the privacy of Torp. At the same time, I think it is unreasonable to think that all topics relating to marital status should be stamped as irrelevant. Paul emphasizes such questions in 1 Timothy's letter. It is probably well known that my basic belief is that the remission is wrong. This I justify with Matt 19.3-10 and some other Bible verses. At the same time, I think the question is difficult. Many conservative Christians believe relegation in certain situations may be right. I respect that. On the other hand, I strongly believe that Christian leaders should refrain from repentance - for example, because Paul writes that a leader should be "a man of man." Finally, in the text of 1 Timothy 3, Paul writes that a supervisor "have a good testimony from those who are outside". It must of course not be interpreted so that a Christian leader must be popular and loved. On the contrary, there is much in the Bible that the one who proclaims the word of God true and correct must be prepared for both resistance, persecution and backlash. At the same time, Paul believes that it is important how Christian leaders are perceived by people outside the congregation. Also, at this point, I think Torp is coming short. He does not give a good testimony of marrying quite quickly after divorce with a woman who is more than twenty years younger than herself. This is a difficult topic. I find it difficult to be balanced, precise and respectful (towards Jan-Aage Torp, which is undoubtedly in a very difficult situation and deserves care and prayer). But here was a brief reason that, in spite of everything, I think pastor Torp should end up as a pastor. (quote ending). http://blog.janchristensen.net/2011/12/nr-295-informationsleder-i- norwegian.htmlI went out today Pastor Jan Åge Torp to blI'm overwhelmed by him, but I'm good at that. He meant p. a that I was unfriendly and ugly when I could talk about him and Evangelist Emanuel Minos. Manuel Minos a door opener for demons. When Emanuel Minos repeatedly against better conscious will opens up such wolves in sheep's clothes as Jan Åge Torp, Jan Hanvold and others repented preachers, then he is a door opener for demons. The demons do not come forth themselves, but they have their handcuffs, those who live in rebellion for the word of God and the will of God. King UssiaUssia was 16 years old when he became king - and he was 52 years old. Here we meet a god-fearing man who sought God and did what was right in the eyes of the Lord. He was raised in a "Christian home" and took good care of his childhood and legacy from home. The people loved Uzziah because nobody had done so much for Israel since King Solomon. King Ussia had a very good start to his race. He had a good "entrance". But how was the end of his journey? That was the end we were going to sign. Yes, when Ussia was at its peak, something happens. Why did Ussia fall? 1) Ussia began to exalt itself. He forgot that true progress has more to do with who we are than what we do. He forgot that it was God who had helped him to the power and honor that he had achieved. 2) He had not taken the time to build character in his life. His character was in no way in relation to what he had accomplished. It is important to build a strong character in God before embarking on a service for God. Otherwise, sooner or later there will be a lack of character that becomes visible to all ... 3) Pride came into his life. Pride always comes before a fall. Ussia could not withstand success. But what is pride? - Pride is "mother of all sin" (Lester Sumrall) - Pride is a spiritual cancer. It eats the possibilities that the love and the fruit of the spirit can flow .- Pride is selfish. It always has the ego in the center. ("I'm right ...") - Pride is arrogance. It is to exalt itself. One expects privileges, one wishes to be noticed and become popular. - Pride is mind. One can not tolerate, but react with anger. In verse 19, we see that Ussia reacts with anger - typical pride ... We all need someone to correct us / exhort us. Ask yourself: How do I receive exhortation and correction from other people? The way you accept correction will determine how to end your race! Ussia became leprosy and he remained leprosy for the rest of his life. He was first called King, but ended up being known as leper. There was no longer talking about what he did in the beginning. What matters is how to complete the race! This man had passed the throne at the age of sixteen, destined to become one of the greatest kings in Judah. He received counsel from the prophet Zechariah. He received visions from the Lord. He was mightily blessed by God. The Bible says that Uzziah sought the Lord - and God made him prosper and become strong: "God helped him ...." (2 Chronicles 26: 7). ".... His name came wide, for he was helped in a wonderful way, and he gained great power." (verse 15). Before Solomon, Uzziah had the best reputation of all the kings of Judah. He was anointed by God. He began revival in the land, torn down idols and wandered according to the word of God. When this brave king drove his carriage through the streets he was shown honor and respect. He received gifts and homage from all over the world. But, the scripture says: ".... when he became mighty he became proud in his heart to his own destruction. He became disobedient to the Lord his God and entered the Lord's sanctuary to burn incense on the smoke altar. " (verse 16). Tranquility overwhelms this man of judgment. He wanted to be a priest in addition to King! In disobedience Uzziah entered the temple and began to smoke with incense in front of the altar. He received a penalty for this - and when he pointed a furious finger in response, his hand immediately started to fade. It suddenly became leprosy. Ussia had to be thrown out of the temple of God! Oh what a shame! One of the greatest, richest kings in Jude's history must now be isolated. He was taken to a small house where he spent the rest of his days like a leper: "Since then, King Uzziah was leprosy for his death day. He lived in a house for himself as a leper, for he was excluded from the house of the Lord ... . "(2 Chronicles 26:21) .Uzziah died in isolation - cut off from any blessing from God! When this once the mighty man died, amounts would have gathered around him. His passing should have been an honor to God's name. Instead, he died as an almost unknown man, with his body absorbed by leprosy. Ussia missed his determination! Pastor and Apostle Jan Åge Torp in Oslokirken and all others repatriated as Christians and still preachers are our Uzziah, Uzbek, who became leprosy! The word of God is very clear, all who are reunited as believers shall not be Pastors or Apostles like Jan Åge Torp, Jan Hanvold and many with them are. Had they sat on the last bench and been like him we read about in the gospel of Luke I should have time? tilt, then there had been a matter between him and God. Luke 18 9 He also said this parable to anyone who trusted in themselves that they were righteous and despised the others: 10 Two men went up to the temple to pray; one was a Pharisee and the other one a tolder. 11 The Pharisee stood for himself and prayed like this: God! I thank you because I'm not like other people: robbers, unrighteous, wizards, or, and, like this, lows. 12 I fast twice a week, I give tenth of all my income. 13 And the messenger stood far away, and did not even want to lift his eyes to heaven, but clung to his breast, saying, God! be merciful to me 14 I say unto you, This was justified down to his house before the other; for every one who himself exalteth, shall be denied, and he himself shall deny shall be exalted. But here one exalts himself to apostles, pastors, television savers and I do not know what. Pride and arrogance are. They make themselves so insane and so innocent, only they get the will of the flesh and the mind into the new life, so they do anything. False humility calls the Bible this, not for anything else. King Ussia was leaningKong Ussia was leprosy and these people are already leprosy and will spread their leprosy over all where they come, therefore the scripture says that we will not even spit along with these. 5:11 But what I wrote to you was that you should not deal with anyone who is called a brother, and is a whore or an idolater, or idolater, or a baker or a drinker or robber, so that you do not even eat with him. no way take part in their evil deeds, if we do, we become accomplices. That Emanuel Minos and many others support spedal people who are spiritually wolves in sheep's clothes, I think that's bad! Yes, directly nauseating and unhappy. What is the solution? The solution is simple. Distances you from those who do not live as the word says. And stick to those who live and learn right. This is and remains the solution. All of us need God's grace when we all get short, but there are still rules of God in the word of God and in the spiritual life with Jesus and in the congregation we must and will relate to. Excommunication for preachers makes them excluded for the service of Pastor and teacher When we read the pastoral letters that Paul teaches about this and elsewhere, it becomes clear that repented preachers as believers are unfit for service. Just as Kon Ussia was incapable of performing the service that the Levites should do, everybody who chooses to marry after a factional breach. This is not what I or you mean, but spiritual truths and this is also a spiritual law. If we allow revered preachers, we can only put the door at wide gaps for Satan. Ezra got all the gifts to divorce - that's the solution today also Ezra 10. 10 Then the priest Esras stood up and said to them, "You have acted unfaithfully and have taken strange women unto wives, and thus ye have increased Israel's sake. 11 Now therefore, confess it to the LORD God of your fathers, and do his will. Distinguish you from the other people in this country and from the stranger women! 12 Then all the people answered and said in a loud voice, Yes, as you have said, we are obliged to do. 13 But the people are tall and it is now rainy so we can not stand out here and this is a work that can not be done in a day or two; for there are many of us who have sinned in this matter. 14 Let therefore our princes stand before all the people, and let all those in our cities, who have taken strange women to wives, meet at the appointed times with the elders and judges of every city, until we turn away the burning anger of our God from us and this matter is settled. 15 Only Jonathan the son of Asaiah, and Jahzeiah the son of Tikvas, opposed this, and Meshullam and the Levite, Sabbetai, supported them. 16 Then the returnees did as Esa said, and chose Ezra the priest and some men who were heads of their families, all of which were mentioned by name, and they met on the first day of the tenth month to investigate the matter, 17 and they were finished with all the men who had taken strange women to wives, until the first day of the first month. 18 Among the sons of the priests they found someone who had taken strange women to wives; These were: of Joshua son of Josadak, his sons, and his brethren, Maaseiah, and Eliezer, and Jarib, and Gedaliah; 19 They gave their hand that they would divorce themselves from their wives and sacrifice a beast of the flock for a guilty sacrifice for the guilt they had committed. Notice the wording of verse 19: "for the sake they had committed." The fault they had incurred, it is exactly that Pastor Jan Åge Torp. Pastor Jan Hanvold and all others who are divorced as a believer and who afterwards as a believer marry you. They commit themselves and all others who come close to them and who stand with them in one way or another. They also blame themselves and become involved with them in their evil deed, as it is according to what the word of God teaches. To marry a breach of cohabitation, it excludes if one wishes and wants to be an Apostle, Prophet or, in truth, a trusted servant or servant of the Lord.Jacob 3. 1. My brothers! Not many of you become teachers, because you know that we will get its heavier judgment! 2. Joh. b. 10 If anyone comes to you and does not teach this doctrine, do not accept him in your house and do not welcome him! 11 Whoever welcomes him, be entrusted with him in his wicked deeds. Luke 16 18 Everyone who divorces his wife marries another woman, acts as a whore, and every one who marries a woman who is divorced from his husband, he is running hor.1. Choir. 7. 10 But I give the married, but not the Lord, that a wife shall not divorce his husband; 11 But if she is divorced from him, she continues to be unmarried or divorced with her husband-and that a man should not divorce his wife.1. Tim. 5. 8 But if anyone does not care for his own, and most of his people, he has denied the faith and is worse than an unbelief. 5. 28 Then the men owe to love their wives as their own bodies. He who loves his wife loves himself.